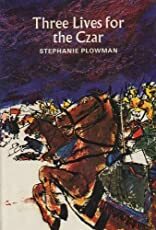 Three Lives for the Czar was written by Stephanie Plowman. Three Lives for the Czar was published by Houghton Mifflin Company. Subjects of Three Lives for the Czar include 1904-1914, Fiction, History, Juvenile fiction, and Russia. About Stephanie Plowman (Author) : Stephanie Plowman is a published author. Published credits of Stephanie Plowman include Three Lives for the Czar.